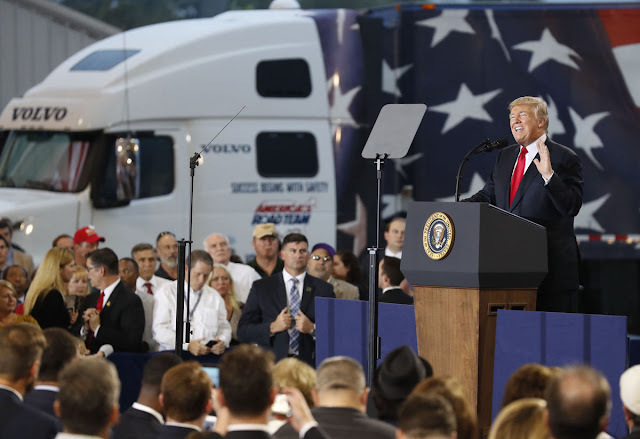 "There’s very little in the framework...that would directly benefit most truckers," Breitbart's John Carney writes, saying that President Trump's plan would raise taxes for a family making the median income for truck drivers by about $200 a year. Wednesday night that his tax reform plan would be "rocket fuel" for America's economy. "You're going to make more money. You're going to do better than ever before. And we truly admire you. You are our heroes, believe me," he added. "You are our heroes." The tax framework released by the Trump administration last week nearly doubles the standard exemption from $12,700 for a married couple to $24,000. But it also would eliminate the personal exemption of $4,050 per person, which for a family of four amounts to $16,200. So for a married couple with two children, their basic deductions under current law would be $28,900. Which means that the Trump plan actually lowers the basic deductions available for middle-class families. Trump told truckers that the average family would save about $4,000 under his tax plan. “My Council of Economic Advisors estimates that this change, along with a lower rate, would likely give the typical American household a $4,000 pay raise," Trump said. Any tax cut for this driver’s family would depend on an increase in the child tax credit, something the framework called for but did not specify. Currently, the couple could deduct $1000 per child. If the tax credit were increased by only 10 percent, they would see no tax cut at all. If it increased by less, they would get a tax hike. If it is increased by more than 10 percent, they will get a tax cut.